Like her sister ships, the Azamara Quest is a mid-sized beauty with a deck plan well-suited to the needs of modern voyagers. You’ll never feel crowded in the comfortable social spaces of Azamara Quest’s bars, restaurants, lounges, Casino and Cabaret. Nor will you feel like a sardine jammed in around the pool, where our attentive staff is always ready to offer complimentary bottled water, soft drink or fresh towel. Azamara Quest staterooms feature modern amenities, furnishings, and European linens. And one of the greatest features of this ship is a large number of staterooms with verandas. There’s nothing better than opening your door to the fresh sea air and views. Azamara’s three friendly ships are an altogether wonderful place to call your home away from home! Book on the Share & Save Sale and save up to 50% off the second guest* when you book a twin cabin. Plus, receive up to US$500 shipboard credit per stateroom on select cruises* and book in an oceanview cabin or higher and you’ll receive complimentary internet* for use on one device. $10pp deposits* are available exclusively from Cruise Guru on all sailings departing after 10 September 19 when you book by 30 April. View $10pp deposit cruises. The Azamara Quest Shop. Pick up sundries, casual wear and swim fashions, sunglasses, accessories, music and shipboard keepsakes. This is a great place for small gifts to take back home. The Photo Shop. Stop by for camera supplies including batteries and digital memory cards. The shop displays photos available for purchase of the previous day’s events, taken by the shipÂs roving photographer. Discoveries Lounge: Located just outside Azamara Quest’s main restaurant, this congenial bar is a favorite gathering place for pre- and post-dinner conversation and drinks. Bar service includes a full selection of fine wines, mixed drinks, and premium spirits plus the entertaining banter of Azamara Quest’s friendly bartenders. Mosaic Cafe and Mosaic@Night: Our onboard coffee corner may very well become your favorite nook on the ship. You’ll find all your favorite coffee drinks and you can order them just the way you like. If you’d like to try our Nespresso specialty coffee (for a fee), Mosaic Cafe is the place. We recommend that you slip right into a comfortable seat and sip for a while-you never know who’ll walk by. The Living Room: It’s the perfect space for guests throughout the day and evening to engage in lively conversations, take in interesting speakers, peruse art, play a game of cards, enjoy a cup of tea or coffee, wines & tapas, delightful music, or simply relax with a good book. After dinner, the Chef occasionally sets up for a featured and delicious dessert. Cabaret Lounge: Enjoy live performances of professional full-stage musical revues, classical soloists, bands and other entertainment in a cabaret nightclub with a full bar and cozy tables. You could see as many as three distinctly different shows while onboard. And considering the cost of theater and entertainment tickets back home, isn’t that nice? Casino: Test your skill, or prove to your fellow guests that beginner’s luck is real. The Casino will keep you entertained with blackjack, roulette, slot machines, and three-card poker games. Group and individual gaming lessons are offered at no charge-a great way to learn gaming strategy! The Casino accepts payment by Key Card, cash, credit card, travelersÂ checks and foreign currency. White Night Party: Dont think of missing Azamara Quest’s famous White Night party and buffet, held at least once on every cruise (weather permitting). Colorful decor and linen-draped tables, a fabulous buffet feast, and boutique wines on the house make this an event like no other. Dance late into the night as the live band kicks in after dinner. Wearing white is optional, but encouraged! If you’ve ever wished for a week or two to reboot, this is it. Treat yourself to health, beauty, and restorative treatments in our all new Sanctum Spa. With a focus on wellness and vigor, our relaxing spa offers you the chance to focus on you something you don’t always have time to do at home. Enjoy an oceanfront massage, a quick manicure before hitting the town to explore, teeth whitening, barber services, or even a healing acupuncture treatment. But beyond the Sanctum Spa, Azamara Quests is also pleased to offer a full range of complimentary onboard fitness and nutrition classes, including one-on-one personal training for an additional cost. An Azamara Quest voyage is the perfect opportunity to focus on your health so let us treat you to some rest, relaxation, and rejuvenation. Not the class type? Then head to our well-equipped Fitness Center onboard Azamara Quest, filled with lifecycles, treadmills, stair-steppers and weights and work out at your own pace as you enjoy spectacular ocean views. Customised personal training: Certified personal trainers will work with you to develop a customized workout plan and lead you through individualized instruction. Take written material back home and keep it up! Customised Pilates instruction is also available. A voyage is a great time to experience the benefits of this ancient Chinese system of healing. Acupuncture strengthens the immune system, fights disease and controls pain while dissolving accumulated stress and restoring the body’s natural balance and energy. Azamara Quest’s acupuncturists are experienced practitioners licensed by the National Certification Commission for Acupuncture and Chinese Medicine. A variety of treatments are available for pain management, smoking cessation, weight loss, stress reduction and more. After just one session, you may notice immediate benefits in circulation, heart, stomach, skin and mood. Please inquire at the Spa for scheduling and pricing. Azamara Quest takes you to remarkable destinations. We also give you more time to fall in love with them. It’s what we call Destination Immersion-and it’s what happens when you can stay longer and experience more on our voyages. More time to get to know the local life and culture in every port. After all, isn’t that what travel is all about? At Aqualina, you will find some of Italys most celebrated dishes. But you will also find contemporary inventive cuisine. Start with lobster ravioli, followed by arugula and radicchio with prosciutto chips, and a Venetian seafood platter. You will not be able to say no to our famous desserts: marsala custard, lemon souffle, or tiramisu. Our chefs love to be inspired, so after an on shore visit to a local market, you can also expect a delectable dish so local, you will feel like you are not onboard anymore. Steaks cooked to perfection. Crab cakes with remoulade. Lobster bisque. Lamb, game hens and seafood. And last but certainly not least, our famous mini cinnamon-sugar donuts with dipping sauces for dessert. (Yes, they are as good as they sound.) But at Prime C, you are in for more than an array of delectable dining. Expect a marvelous evening in a warm wood-paneled ambiance with stunning views and lush decor. And, if our chef has made a visit to a local market while we are in port, you will also have an authentic local dish to look forward to, made just for you. Fresh ingredients, careful preparation and a variety of menu choices. Azamara Quest offers a choice of six distinctive dining options, including room service. Whether you’re a fan of haute cuisine or down-home cooking, expect the same delicious quality. Bon appetit! Buon appetito! Buen provecho! No matter how you say it, you’re in for a real treat. You’ll be hard-pressed to find such a collection of limited production, small label and rare vintage wines anywhere on the high seas! And with vintages from France to California, and Argentina to South Africa, you’re sure to find a wine to suit your palate. And your journey. Our knowledgeable sommeliers can help you pick the perfect wines for your evening meal-and your voyage!-and be sure to join our Wine Corner gatherings in the Mosaic Cafe, perfect for discovering and enjoying new wines and benefiting from the thoughtful guidance of our sommelier. Discover the world through dishes and flavors from the places we visit. Whether it’s our Destination Immersion dinner buffet or the Destination Immersion cuisine on our dinner menu, give your dining a little local flavor and enjoy on shore tastes onboard! Of course, you will also enjoy a wide variety of nightly selections such as filet mignon with black truffle sauce. With its elegant yet lively dining and renewed decor, it’s easy to see why this restaurant is a hands-down favorite, the culinary heart of our ships. Gather at Discoveries Bar for drinks before or after dinner. Casual “pool grill” by day. Then, fine tablecloths and flickering candles will set the mood for a sit-down al fresco dining experience by night. Taste your way around the world with exclusive personalized dishes using local flavors of the places we visit on our Destination Immersion cuisine dinner menu served by our professional wait staff. And for a little touch of whimsy, a self-serve frozen yogurt station-Swirl & Top. With a variety of flavors and your choice of toppings, it’s the perfect way to cool off during the day or end your evening meal. The best way to see where you are in the world is not by looking at your itinerary. It’s by checking out the menu at Windows Cafe! Our daily themed dinner often takes its inspiration from the region we’re visiting-Indian, Mexican, Spanish, Italian. We also create an extra live station made from local ingredients purchased in port: Greek salad made with local feta (Greece), pasta prepared with local mushrooms (Italy), fresh Mussels served with garlic bread (Netherlands). Take in the fresh breeze at an outdoor table and relax in the easy and casual atmosphere of the newly renovated Windows Cafe. Enjoy an intimate breakfast, lunch, or dinner for two or a lively meal for six with our flexible seating options. And speaking of choices, selections change daily. Choose from fresh sushi, stir-fry and pasta, salads, smoked lox and other cold fish, a carving station and of course, desserts. In all of our dining rooms, we encourage guests to follow a resort casual dress code, following good taste and common sense. When dining at Windows Cafe, guests must wear footwear and a cover-up or shirt. In Prime C, Aqualina and Discoveries Restaurant, many guests enjoying dressing up. Formal evening wear (tuxedos and gowns) is not expected. We recommend that men bring a sport coat or suit; this attire comes in handy for evenings onshore as well. For women, dining attire includes dresses, skirts, blouses with pants and capris, and other appropriate attire. 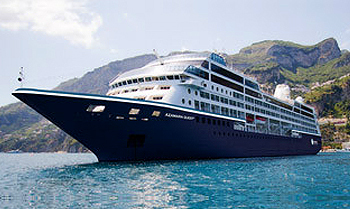 Azamara Club Cruises’s three boutique-style ships carry just under 700 guests, with a one-to-two staff to guest ratio. And you’ll love the fact that 93% of the staterooms offer ocean views and 68% have a private veranda. Destination-rich travel experiences bring guests onboard, but Azamara Quest’s outgoing staff and crew bring them back. Service is prompt and attentive, and the staff and crew quickly learn guest’s tastes and preferences. The onboard atmosphere is genuinely friendly, with senior officers and crew mingling easily with guests. Azamara’s club-like community appeals to couples, singles and grown families. When you travel with Azamara Club Cruises, pretty much everything you could ever want is included:AzAmazing Evenings* eventSelect standard spirits, international beers and winesGratuitiesBottled water, soft drinks, speciality coffees and teaSelf-service laundryShuttle service to and from shore excursions (where available)Concierge services for personal guidance and reservations24-hour room serviceDaily turndownWelcome fruit basketSuite guests get additional inclusions, enquire for details.